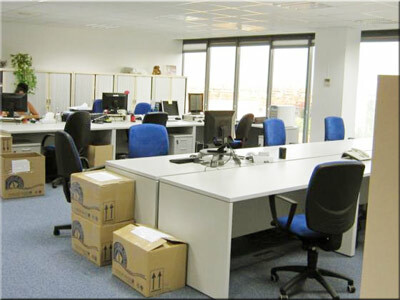 Moving office in London must take place without any interruption to the functioning of the business. It is important that an earlier meeting with our representative is arranged so that we can plan your office move carefully and consider every detail in order to avoid any potential problems, difficulties and delays. As a local office removal company in London we offer such a meeting at no cost to avoid problems like this: The situation occurred when we were moving one of the biggest banks in London. Only one day prior to the office removal the bank contacted us and booked the job. Unfortunately there was no time for the proper preparation, survey and drawing the office move plan as the relocation was left until the last minute. Despite the short notice given, as professional and cheap office movers in London we decided to help. Well, our horror movie has began. Removal men had no move plan. Nobody knew what office furniture should be moved, loaded, transported and unloaded first. No one knew which room the office equipment, individual desks, cabinets, chairs should go to and how to set them up. Besides the company refurbishing the office and the new business premises to which the bank was relocating, did not meet the deadline so they were finishing their tasks while we were carrying out the commercial move in London. The carpenters were finishing with the floor and our people had no choice but to put some of the furniture on the slowly drying up glue between the joints. All this has created an incredible mess. One piece of furniture was moving several times from one place in the office to the before it came to the right place. It was three London office removals in one move. We worked day and night for three days to catch the Monday morning, when the bank was hoping to start work as usual. For that reason we offer a free pre-move planning meeting and a free removal quote. Once you have received our proposal and move schedule we sign the contract that will guarantee you that the service will be done on time, professionally and at a fixed price. If you decide to pack your office files yourself, a few days before the scheduled date of your commercial relocations in London we will provide you with all the necessary materials needed for packing: boxes, moving crates, bags, tape, stickers, etc... Of course our London office movers will take on their back all the hardships and difficulties associated with moving. We take full responsibility for the entrusted to us property and office equipment. We can assure that your business removals in London will be carried out by our full-time staff with extensive experience in moving servers, furniture and office files. We will secure your computers and office equipment. All your possessions will be then smoothly moved and loaded on a car that was specifically designed to prevent furniture from any bruising or damage. The destination all the furniture, cardboard boxes and office equipment will be planned and drew on the floor plans in advance so all your equipment can be placed in the designated areas. A lot of companies and firms in London have trusted us already because we have the experience, the best people and we take the responsibility for the items we move. 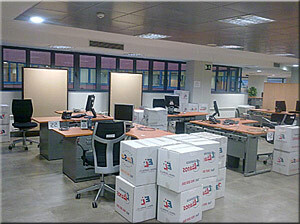 We guarantee the high quality office removals services in London at very good rates. Our local office moving costs and prices will beet most London office removal companies providing moving services at the same level. Each company that will contact us will be offered an interesting quotation tailor-made to its individual needs. At no cost we will give you an idea of how to organize your removals in London so that it interferes as little as possible with the operation of your company. Apart from the office moving services in the central, West, South, North and East London area we also offer other services. Man and van London - our domestic division will cover any small moves at better rates. They can take any size removal jobs at a short notice. House removals London - are you planning to move a house? Great, we have the solution for you. Whether you live in the city centre, on Oxford Street, Regent Street, and Bond Street or in Fulham, Hackney, Richmond or anywhere else we will move you home at affordable cost. Cheap furniture removals. 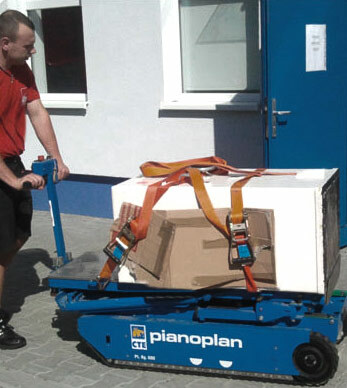 Warehouse and machinery removals London - we can also handle large moves like factory relocation or a warehouse moving projects along with the racking system putting down and raising up. The city of London is regarded as the oldest quarter in London as a whole. It is established in 50 AD by the Romans. Most of the popular and renowned attractions in Great Britain are homed in here. The city covers an area of about one square mile. This explains why it is sometimes referred to as Square Mile. In today's England, the city shares boundary with Town Hill, Liverpool Street, Barbican Tube station and Blackfriars. London city is located in the heart of London which is a stone-throw away from the South Bank, West End, Brick Lane and the historic Southwark. If you are looking for the cheap office removals companies in West or East Central London we have the the expertise to and the local knowledge. We have moved plenty of business in EC1, EC2, EC3, EC4, WC1, WC2 postcode areas. London city boasts of a number of things ranging from cultural scene, arts to gastronomes paradise. You will be surprised to discover that many people who are working in the city of London are not resident in it but in the nearby towns and cities. This fact will be obvious to you once it is the end of work. However, this does not mean that the city is not booming with life. It is still the most cosmopolitan area of the England capital. Residents of the city of London lack nothing. Every single day there are people looking for cheap London movers to relocate their premisses. It is easy to get around the city of London because of the excellent transportation system. There are several train stations bringing people to this metropolitan. Liverpool Street Station located at the centre of the city is the desired station for Stansted Express train bringing people from Stansted Airport to London City. There are multiple transportation options available at the Liverpool Street Station. Taxis, train, tube and buses providing transportation services to the Central London and other location are available in the place. 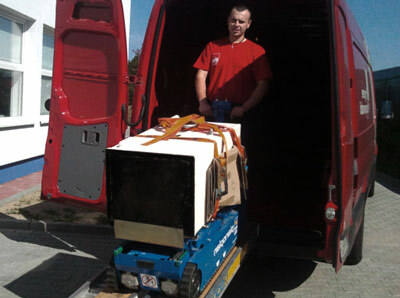 There are also quite a few removal companies in London ready to help you with your belongings. There are also bicycle hire services in this station in case you preferred getting to your next location with bicycle. Other train stations providing train services in the London City are London Blackfriars, London Fenchurch Street, Moorgate, Themeslink and London Cannon Street. If you are moving from or to any of those location you should contact our moving companies that will help you move to other areas of North, West, East or South London. Getting a visitor oyster card is a nice option if you are going to stay in the city for some days. It is a better way of getting around. You can buy this card either at Tube station and even have it sent to your home. Car park can be very costly. There isn't much cars in the centre because of congestion and the busy nature of the city. Using the train services remains the better way of commuting or getting around. When it comes to attractions, London has plenty of it. The variety of architectural styles is enough attraction of its own. There are lots of 17th century churches designed by famous historic architect like Sir Christopher Wren. 18, 19 and 20th styled architectures are all available. There are skyscrapers as well. What to do during the move? If you are using a moving company in London for any reason, you should expect to have some free time as the removal experts can do everything for you. You can give you employees some time off work and they can have the best time in the city. There are a lot of things to do when you use Cheap London Removals and have plenty of time for yourself. Do you want to shop? There are numerous stalls and shopping malls where you can buy anything you want. However, centre is not the best shopping district in England because it is meant to be a leading financial district and not a retail district. There are different restaurants in the city that serve different menus that will satisfy the taste bud of any foodie. Most of the restaurants are located in the Bank Tube Station. Some of the popular restaurants in the city include Cheapside, Leadenhal Street's and Lombard. We provide removals in all of those location. If you are a company director and are coming from somewhere in the UK to supervise the cheap Removals London you probably need somewhere to stay. Accommodation can never be a problem for people in a need for a hotel room. There are various types of accommodation to meet various needs, taste and budget. Luxury and five star hotels as well as other hotels of lower category are all available. Surf the internet and you will get multiple accommodation options that will meet your needs, budget and taste. If you are in a hunt for cheap London removals firm we will be happy to help.